Refrigeration Compressor Lubrication requires the highest quality raw material and formulation experties to assure proper lubrication over the lubricant life required by OEMs. Kiro is prode to introduce Xaerus refrigeration compressor lubricants developed to enable equipment manufacturers and end-users to select the oil for their system that will deliver optimum value through enhanced protection, long oil life and high system efficiency. 2 stage hydro cracked (at 1st stage removes carbon and at at 2nd stage hydrogen) to make oil more purer. Colour - Xaerus oil color is lightest i.e. 0.5 as per ASTM D1500..
Higher Aniline Point, means less aromatic. More aromatic means more oil loss. Reduces oil carry-over by 50-80% : Lower oil carryover reduces sludging and deposit formation in evaporators, lowering maintenance cost. 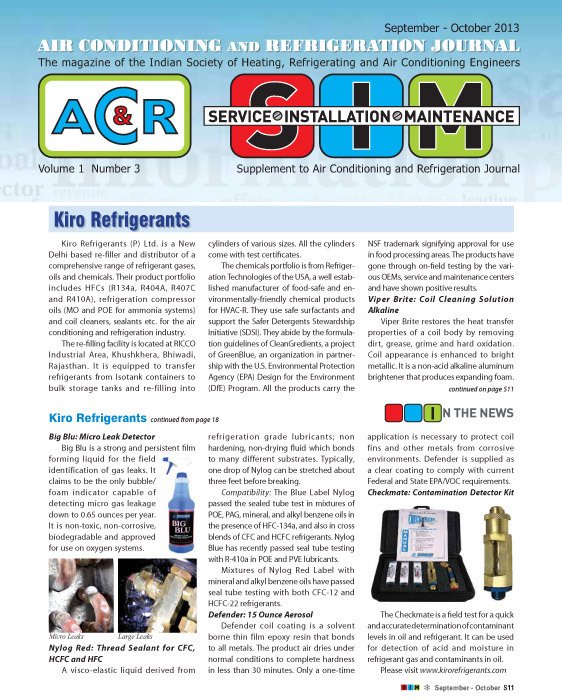 Copyright ©2012 kirorefrigerants. All right reserved.